For many people, hiking isn’t what immediately comes to mind when they think about Los Angeles. It may be the center of the glitzy, movie universe, but it has an outdoorsy, rugged side that it seems only the locals really understand and fully appreciate. If you’re looking for a vacation spot that has the best of both worlds, take advantage of the first-rate dining and accommodations of Los Angeles, as well as some of the best hiking spots in the country, which are just a short drive away. Here’s a look at some of the best hiking spots in and around LA. Franklin Canyon Park: Located near the center of the city, Franklin Canyon Park is a getaway in the midst of an urban setting. If you’re looking to get out into nature without leaving the city, this is the hiking spot for you. At Franklin Canyon, there are over 600 acres and five miles of hiking trails to explore. Being in the middle of the city, the park has been used as a location in many movies and TV shows, including as the fishing lake in the opening credits of The Andy Griffith Show. Wilacre Park: Wilacre Park, which is often referred to as Fryman Canyon Park, is just a couple miles outside the city. At Wilacre Park, you can actually go on a hike that takes you through three of the cities parks, Wilacre, Fryman Canyon, and Coldwater Canyon. This park is dog friendly and the trails are perfect for short hikes when you don’t have an entire day to dedicate to walking. 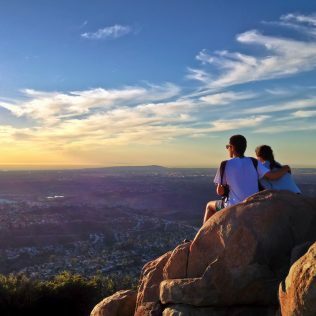 Topanga State Park: The hiking at Topanga State Park isn’t for beginners but the effort you put in on these trails will reap great rewards in the views from the top. This is another park that is just outside the city and is great for people looking for something nearby. Solstice Canyon: If you’re looking for a hike that’s not too strenuous, Solstice Canyon is a beautiful place for you to start. This hike is almost more like a leisurely stroll with beautiful Pacific coast views and plenty of shade. Getting there is also a scenic drive; you just follow Pacific Coast Highway to Solstice Canyon Road. There are some harder hikes available at Solstice Canyon too, including plenty of switchbacks and trails exposed to the direct sunlight, without any shade. Whatever you’re looking for in a hike, you can probably find it in Solstice Canyon. Vasquez Rocks: Vasquez Rocks is one of those special places you only find in the Western United States that makes you feel like you’ve been transported to another planet. The park was even used as a location for the original Star Trek series. The Pacific Coast Trail, which runs from Canada through the US, passes through this park too. Whether you’re a movie buff or consider yourself more of the outdoorsy type, there’s something for everyone when you visit Los Angeles. Make sure to check out our fleet of vehicles to get you to the best hiking trails!